New listingMen's Armani Hooded Jacket Size Large. Pit to pit is 21 inches. Men's Armani Hooded Jacket Size Large. Pit to pit is 21 inches.. Condition is Used. Dispatched with Royal Mail 2nd Class. Large chest logo,VGC. dark grey Coated light jacket. consealed light hood. size L/G ,pit-2-pit 23", L 26". Lining: 50% Nylon; 50% Acetate. Fabric: 100% Cotton. Sleeve underarm to cuff: 18". Long length sleeves. Length: 29.5". Underarm to underarm: 20". Sleeve Lining: 100% Acetate. It features a collared neckline and has a button fastening. It is made from a blue coloured cotton material and would be ideal for different occasions. Neckline: Collared. Style: Denim Jackets. Material: Cotton. PIT TO PIT 22". SHOULDER 18. LIGHT COTTON MATERIAL. BEAUTIFUL DESIGN AND CUT. (Slim Fitting). Pucker Clothing UK. Pucker Clothing UK London how to wear and styling from the Pucker Team. Perfect For Your Designer Collection, 100% Authentic. ITEM CONDITION. This is a great evening jacket. The model is size M and is 6 ft tall. The jacket is in very condition with no defects whatsoever, and is clean and ready to wear. Pit to pit: 22 in / 56 cm. Shoulder to shoulder: 19 in / 48 cm. Waist: 21 in / 53.5 cm. Minted condition Emporio Armani EA7 Zip Through Side Brand New ! And Never Used. Emporio Armani Ea7 Jacket, Brand New From JD Sports, Condition is New with tags and Unopened as it came from the store and 100 % Authentic and not even opened out of the seal with tags. For sale 15% off and sold out in JD store ( Limited stock as 1 Left). Dispatch time take 48 hours to be proccessed then shipped straight away and this will be shipped by shutl class delivery. Get it while you can !!! Armani Jeans ladies casual style Denim Jacket with belt Size 38. Armani Jeans ladies lovey peplem style denim jacket with a long belt. Size UK 8 Eur 38. and is 22" long from shoulder to hem. Type: Windbreaker Jacket. Colour: Beige. Material: Cotton. Chest Size: 48. Condition: Good Used Condition - the item shows minor signs of previous wear. The model is size M and is 6 ft tall. Shoulder to cuff: 27 in / 68.5 cm. Hem: 19 in / 48 cm. Shoulder to shoulder: 18 in / 46 cm. Pit to cuff: 21 in / 53.5 cm. Full length: 24 in / 61 cm. Waist: 20 in / 51 cm. Sholders @16.5"; sleewes @24"; pit to pit @16.5"; length @20.5". Indigo Series 002. Cotton Hemp Size 40. ARMANI JEANS. Type: Windbreaker Jacket. Label Size: Size 40 Large. Material: Cotton. Chest Size: 40. MISSING THE BELT BUT STILL VERY FINE. Mens Armani Jeans AJ Jacket - White - Size L - Pit to Pit 21"
Armani Jeans AJ Jacket For Sale. Size Large. Pit to Pit 21". Used but still in good condition. Long Black Overcoat With Removable Liner Size XXL By Georgio Armani . No sign of wear excellent condition no abuse rips plucks or marks. Check funnel neck removable liner with zip. Belted waist and cuffs. Armpit to armpits is 26ins. Back of neck to hem is 46ins. Sleeve length from under arm to cuff is 19ins. Composition: 55% Cotton, 45% Polyester Techno fabric Logo detail Turtleneck Long sleeves Two pockets Unlined. Color: Rosso-Red. Pit to pit = 20.5”. All collars and cuffs are clean crisp and sharp. - Collar = M-40”. - Centre base of collar to hem = 26.5”. - Centre collar to cuff = 36”. Button up fastening pockets on front. Designer: Armani Jeans. Color: Brown. 100 % GENUINE OR YOUR MONEY BACK. • Model height 6'1" (187 cm) and wearing size 48. Due to the quality differentiation between different monitors, the picture may not reflect the actual colour of the item. Colour: Light blue, ivory. Womens Armarni Jacket size EUR 46. Measurements in photos. Colour Beige . Condition is Used. Item has had some alterations that can be seen in photos Dispatched with Royal Mail 2nd class Any questions further pictures or measurements please ask Please view my other items Feel free to make me an offer No refunds no returns All sales are final All questions will be answered within a few hours Happy bidding! Type: Blazer Jacket. Colour: Grey. Fit: Slim Fit. Label Size: Size 40 Large. Material: Cotton. ARMANI AJ SIZE M BLACK AJ ICONIC RARE COLLECTORS JACKET. When you receive & I will give you Good straight away🤝. Back - 27,5" / 70 cm. sleeve length (from shoulder to cuff) - 26" / 67 cm. shoulders - 19" / 49 cm. sleeve length (from pit to cuff) - 20" / 51 cm. chest, pit to pit - 21,5" / 55 cm. Mens Armani Exchange Light Grey Jacket Size Large Smart Sports Coat Dinner Top!! • Model height 6'2" (189 cm) and wearing size 48. Due to the quality differentiation between different monitors, the picture may not reflect the actual colour of the item. The item is your responsibility until it reaches us. Lots of interesting details on this jacket,logo on fside. Collar to Hem(Lenght) 31,5"/80 cm. Pit to Pit 22"/56 cm. Do not miss your chance to buy such a great piece of cloth. Due to the quality differentiation between different monitors, the picture may not reflect the actual colour of the item. • Model height 6'2" (189 cm) and wearing size 48. The item is your responsibility until it reaches us. 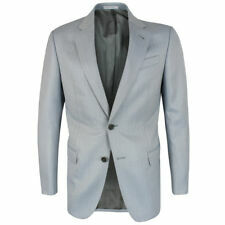 Armani blazer with double raw edge fit person over 6ft. This is an exquisite Grey Armani Jeans Hooded Jacket which comes without the tags. Very warm and has two pockets, drawstrings and shiny vibrant zippers with AJ written. The inside of the hoodie looks vibrant as well with the embroidered AJ logo's covering the inside surface. It also has a rubber AJ logo with the Armani bird. This item is 100% authentic as I would not dare to sell anything replica on any of my listings. Thank you for viewing my listing and let me know if you have any questions regarding the item.